I’ve always known that I’m not particularly good at urban living. I’ve never once imagined a visit to New York, London, or Tokyo would be fun. Truth is, I shudder at the thought. I studied forest ecology because I’m happier in a crowd of trees than a crowd of people. 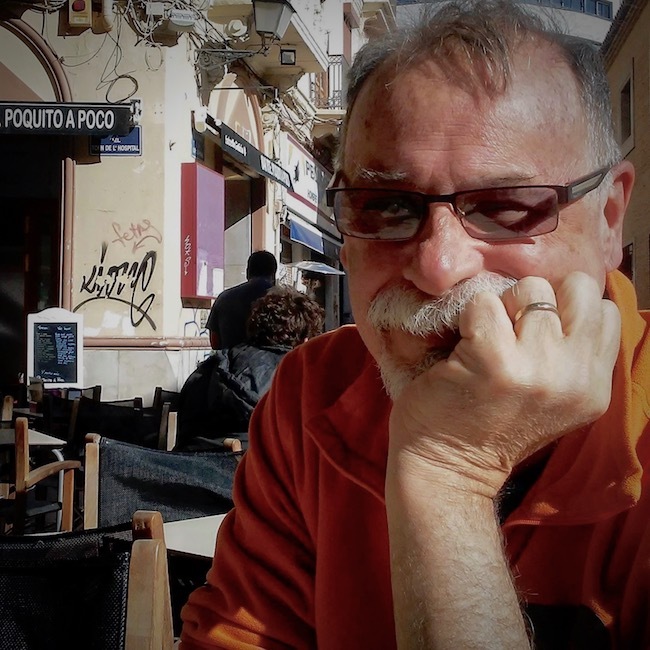 Yet, I agreed to start our retirement in Valencia, Spain. Susan and I knew we needed some city time to learn Spanish language and culture. Because we knew urban living was going to be a hard adjustment for me, we also needed some certainty that we’d be able to continue our active, outdoor oriented life. El Túria, the central park of Valencia, is a fitness paradise and the highlight of our mornings. 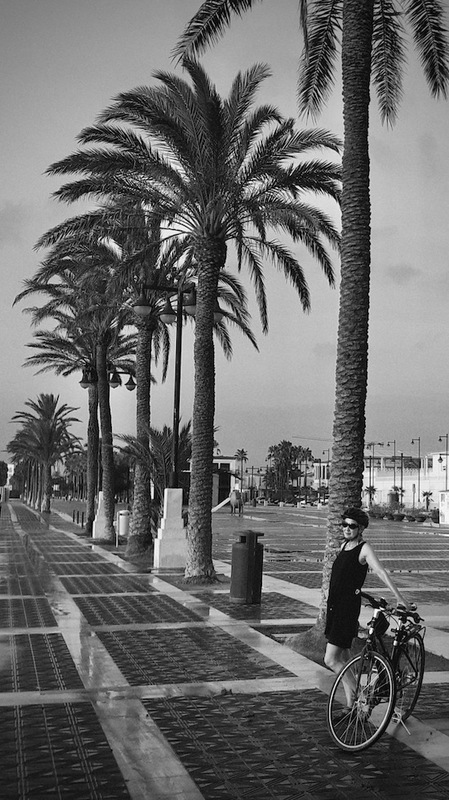 Valencia is easily negotiated by bicycle and on foot. We don’t own or miss having a car. Beautiful Blue Flag beaches beckon. Sandy beaches within 10 or 15 minutes of the city center are so extensive that they’re uncrowded even at their busiest. Redirecting the flow of Rio Túria after the 1957 flood transformed Valencia’s identity and well being. We have about a quarter mile walk to our preferred workout spot in the Jardín del Túria, Spain’s largest urban park. 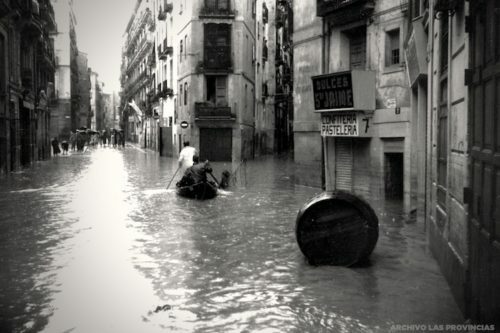 In 1957 the river Túria still flowed along its course through the center of Valencia. That year a devastating flood inundated nearly three quarters of the city and claimed at least 60 lives. By the next year the city envisioned diverting the river around the city. Although the park wasn’t part of the city’s original plan, today, “el río” is a five-mile long green sward, averaging about 600 feet across. Bike paths, running paths, beautiful fountains and green, green, green in the heart of Valencia means that every day thousands of residents take advantage of the park for walks, workouts, or peaceful contemplation. It’s inspiring to see everyone working out in the fresh air. Just as we used to love the camaraderie of a gym, we love the feeling we get of being surrounded by like-minded people in the great outdoors. We’ll never again be one of the runners who bullet past us, or the guy at the pull-up bars who rips them out like he weighs 10 pounds. But there are plenty of people just like us who want the quality of life that daily exercise supports. 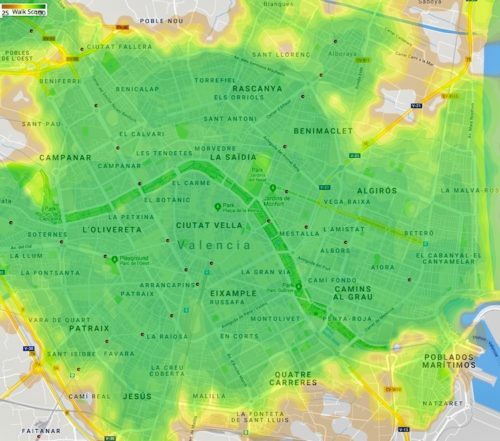 U.S. based WalkScore.com gives Valencia a near perfect Walk Score for almost every area of the city. Scores fall only at the edges of the city. 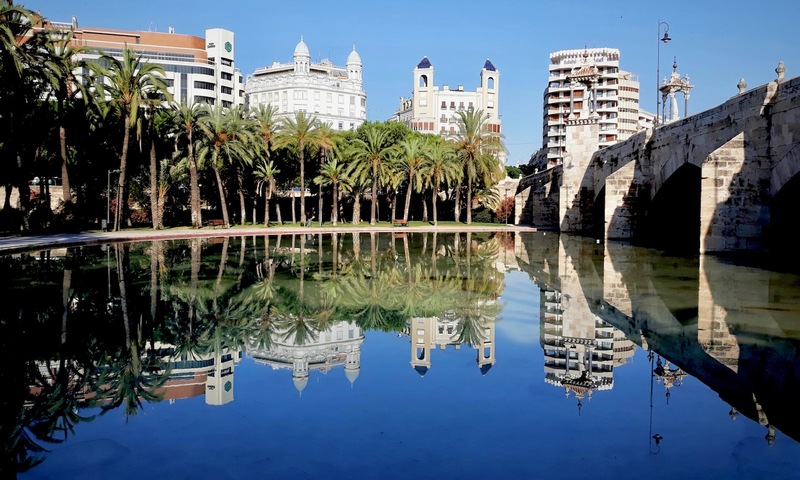 We cannot imagine Valencia without its green river, “the lungs of Valencia”. Once we finish our daily workout, we’re ready to take advantage of Valencia’s incredible walkability. Except during the worst heat of summer, we walk almost everywhere we go. Whether it’s grocery shopping, evening strolls in the neighborhood or meeting friends for lunch, an average day includes at least two hours of walking for us. Valencia is compact. Even though it has a total area of about 134 km2 almost everything we are interested in – museums, cinemas, concert venues, retail and services, medical and dental, the beach – lie within 4 km or 2.5 miles of our home. And those are walkable miles. What Makes Valencia So Walkable? Add in that Valencia is essentially flat (I think the arch of the Exposition bridge across Túria park is the steepest “hill” in the city) and so safe that every woman I know is comfortable walking alone at night. For us it’s hard to imagine that, absent banning all private motor vehicles, Valencia could be any more walkable. There is, however, one drawback to walking in Valencia. During the hot summer months walking can be pretty miserable. We rely more on our bicycles and Valencia’s convenient public transportation network during July and August and limit our walking to early morning or late evening strolls with our dog Lizzie. Speaking of bicycles, the city has over 120 kilometers of cycle paths laid out in a convenient interconnecting network. Most bike lanes are protected lanes – separated by barriers from motor vehicle lanes. Sometimes they are a bit too narrow, but once we learned our way around we’ve found that cycling around town can be faster that waiting for a bus. It’s also possible to take a bicycle on the metrovalencia system and on Renfe’s Cercanias (commuter) trains on weekends and certain holidays. We’ve discovered those are delightful ways to get out of town for a hike or a peaceful ride in the country. Though we love hiking and cycling out in the countryside, our favorite destination is here in town — the shores of the Mediterranean. One of Valencia’s Blue Flag Beaches. Blue Flag designation include standards for water quality, safety, services, and environmental management. The sandy beaches of Valencia are a bit like a golden cousin of Túria Park. They’re so broad and extensive everyone can find a place to play, especially at 8 a.m. But we didn’t discover our appreciation of the Mediterranean seashore until recently. When we realized that dogs aren’t allowed on Valencia beaches, we put off visiting them. After a decade of long, lonely beach walks along the Oregon Coast with Lizzie, we didn’t feel right going to the beach without her. In fact, the first time we took visitors to Playa de la Malvarosa I felt so guilty I stayed off the beach to “keep an eye on the bicycles”. Then one day, I agreed to walk the gentle surf line with Susan. I had no idea, none, how warm Mediterranean seawater is. These days, twice a week we tell Lizzie we’re going to her vet’s office, sneak out the door, jump on our bikes or catch an early morning #93 Bus, and 10 or 15 minutes later we’re at the beach ready for our three-phase workout – wading the shoreline in thigh deep water (feels a lot like walking in deep snow), swimming, and water yoga. The best thing about the beach in Valencia? We get a two-hour workout in and Lizzie never suspects we’re cheating on her. When we chose Valencia for our first retirement destination we knew we wanted to escape the car-centered life we had in the U.S. We wanted an active lifestyle where we could continue our habit of outdoor workouts. Here in Valencia, I’ll never feel the kind of wonder and joy I have when I’m out wandering through the woods but for the time being, it’s a great city for our active lifestyle. It’s pretty good for learning Spanish language and culture too. Here are some websites and posts you might find useful. Valenbisí is the local bike sharing network with something like 2700 bicycles distributed around 275 stations scattered throughout the city. Use of Valenbisí is on a monthly or annual subscription basis. The metro network in Valencia consists of more than 150 km of light rail and metro lines crossing the city and extending to the suburban pueblos. We’ve used MetroValencia for our return journey after cycling from the city center to suburban pueblos. There are six commuter rail lines linking the beautiful railway station Estación del Norte with outlying towns and pueblos in the Valencia Region. Cercanías Valencia (links to Spanish language site ) is a convenient way to reach hiking and cycling trails outside the city. You can read more about how we used Cercanias trains to get out of town for day hikes with our dog Lizzie. I always thought I preferred cycling because it was “fast enough to get somewhere but slow enough to notice”. Like you, ever since we have lived in Valencia, Susan and I walk and notice more than we ever have. Walking, it seems to me, stimulates our minds at the precise pace our savanna bred brains process most capably.